Adopted at birth by a middle-class family, Emily is beaten by her mother and later whipped by her stepfather. She is put into care at 12 and has an abortion after being gang-raped at 13. Continuously abused in a sequence of children's homes, she runs away at 16, becomes a prostitute in Soho and convinces herself she is being punished for killing her baby. Set principally between 1966 and 1972, Runaway captures the changing attitudes of the period, socially, morally, politically, but also in regard to the approach of adults and institutions towards the care of children – the area in which Emily Mackenzie has devoted her entire adult life. 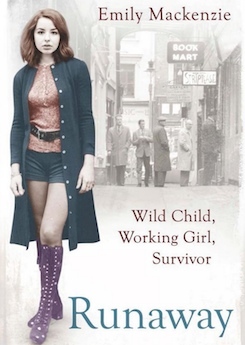 Surviving childhood abuse and life as a prostitute at aged 16 on the streets of London, Emily Mackenzie returned to full-time education, gained a BA in Women's Studies and became a fund raiser for Save the Children. A one time government adviser on child care issues and a regular speaker on the lecture circuit, she sees Runaway as a further campaign tool to heighten public awareness of child abuse, child protection, grooming and prostitution.